Do you want to know which documents are required for Aadhar Card application? We have already shown you various online procedures related to Aadhar Card. In this article, we bring a list of all the documents that you are required to submit while applying for Aadhar Card. Applications for crucial documents like PAN card, Passport and Aadhar Card require a definite set of documents. This post gives you a complete check-list of documents for the Aadhar Card Application. Before enrolling for Aadhar Card, take the complete set of required documents with you. We also recommend you to check your uidai status after enrolling. This will make you aware if any additional documents are required by the UIDAI. Various documents are accepted as valid proof of residence and identity. We have given all the options for such documents which are acceptable by the UIDAI during the issue of Aadhar Card number. You should carry all the documents while you are visiting at the Aadhar Card Enrolment Center. The documents are verified by the UIDAI staff instantly. 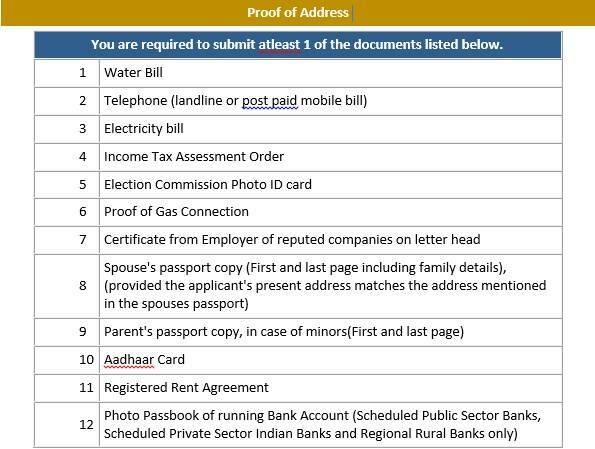 Find below a complete list of all the documents which are acceptable by the UIDAI as your proof of address and identity. Three types of documents are required for Aadhar Card Application. They are POI– Proof of Identify, POA– proof of address and proof for your date of birth. Following are supported DOB documents required for Aadhar Card. Applicants of Aadhar Card can submit any of the above documents as a proof of identify, birth date and address. Besides the self-attested Xerox copies, also carry the original documents for verification. The original documents will be returned to you immediately after the verification. In the absence of proper documents, you may need to revisit the enrollment center. There is also an option to know PF status easily. Hence, do refer the above list carefully before applying for Aadhar Card. The above list of documents required for Aadhar Card application is same as prescribed by the UIDAI. Once you receive the acknowledgement number, your application for Aadhar Card comes under the process. Check the Aadhar status at the official site www.uidai.gov.in. We have also shared check-lists of documents required for Passport and PAN Card. Make Aadhar Card correction online in few minutes! Your Aadhar Card might contain typographical errors. Sometimes the personal details differ due to mistakes in data collection. We have explained both ways in this post- offline as well as online for Aadhar correction. Be it online or offline, your Aadhar Card correction is a simple process. However, remember that Aadhar correction facility allows you to change only a few details. The specific details allowed to be changed have been explained below. Aadhar is a significant identity document. Since, it carries multiple benefits; it is becoming one of the essential documents for the Indian citizen. Besides being a proof of identity, it offers additional benefits, especially, when linked to other services like LPG and bank account. Hence, it is important that you keep your Aadhar Card details updated. Do check your Aadhar Card status carefully after you receive it. Any mistakes and changes in details should be immediately corrected in Aadhar Card. By doing this, you can avoid many hassles in future. Once you update your Aadhar Card, you can also check Aadhar Card update status online. All procedures and guidelines pertaining to Aadhar Card have been published at our blog. Before you start applying for Aadhar Card correction, check the personal details that you are allowed to change. Your Aadhar Card number will remain the same after any such corrections. Further, we have elaborated both the offline and online modes of Aadhar Card correction. You can check the status of Aadhar Card by name and number (or enrollment number). Enter the Captcha Code and the OTP send to your mobile. Now you can select the details you want to update. Click ‘update data request’ button. A new page will appear. Verify the data for Aadhar Card correction and click ‘Modify’ button. You will be directed to a new page. At this page, you need to provide the documents supporting corrections. Be sure that the details on the document provided should match with the corrections you have requested for. Upload the documents after self-attesting them. You can upload documents in gif, jpg or pdf format. Select the Aadhar Card agency or BPO provider. Now you will receive a 12 digits URN number. Preserve this Update Request Number by printing or downloading. The 12 digits URN number will be required to check the Aadhar Card correction status. Download Aadhar data update/correction form. Fill up the form in English/local language. Enclose self-attested copies of documents. In the case of a change in your address, enclose supporting documents accordingly. Mention your Aadhar Card number on all the documents you are providing. Mark the sealed envelop as ‘Aadhar Update/Correction’. Send the form with the copies of supporting documents to the address as applicable to you. This is how you can update your Aadhar Card online or offline. You will receive the Aadhar letter with updates only with following corrections- your name, address, gender and date of birth. For an update of your mobile number and email address, the confirmation will be sent on your registered mobile or email. Are you confused about the documents for Aadhar update? Check our list of documents required for Aadhar Card update. Aadhar Card correction depends on verification of your documents by the UIDAI officials. Make sure you send appropriate documents mentioning your Aadhar no. on them. Keep visiting us for all the information and procedures regarding PAN Card, UID, and Passport. UIDAI’s self-service portal offers a wonderful facility of correcting your Aadhar Card data. After updating, Aadhar Card holders can also check the Aadhar Card Update Status at www.uidai.gov.in. We have already posted procedures to check status of PAN Card, Aadhar Card, and Passport. Anyone wanting to update his Aadhar Card details can do it online. Personal details like your name, date of birth and mobile number can be updated using this service. To check your Aadhar Card update status online, you need to have registered mobile number or email ID. Your valid mobile number or email address should be linked to Aadhar Card. This is mandatory as you will receive the one-time password at the time of UIDAI update. If you do not have a registered mobile number or email, you can opt the offline mode to know your Aadhar Card update status. We have also shared toll free numbers where you can call to know your UIDAI update status. Many times, your Aadhar Card carries some typographical mistake or spelling mistakes. Such things are crucial and it is significant to update your Aadhar data. All you need to do is staying online for few minutes to submit your request for change. No need to worry about the process. We have elaborated it here. Also, a detailed procedure to track Aadhar Card update status is shared. What can you Update/Correct/Change in Aadhar Card? If you wish to change any other detail, then you need to fill up a form at the Aadhar Card centre. How to Change and Correct Aadhar Card Data? UIDAI portal is now offering a number of online services for the best convenience of users. Aadhar update self-service portal is the most popular service among users. Type your Aadhar Card number and Captcha Code. Click the button- ‘send OTP’. You will receive the One Time Password on your registered mobile number and email ID. Select the information you want to change or correct. Upload the required documents to update or correct data. Select the BPO service provider. There you are! You will see a URN number generated on the screen. Note down the URN number carefully. You will need it while tracking your Aadhar Card update status. You can download it or take a print out of URN number. URN is the update request number generated automatically after you finish your Aadhar update online. You should first go through Aadhar Card Application Form download article to download your Aadhar Card form. We are sure you have now updated your Aadhar Card details successfully. Now, since you know how to update or change UIDAI data, check the Aadhar Card update status. Enter your Aadhar Card number or URN number in the respective boxes. Hit the ‘get status’ button. There you will see the status of your request for correction. If the updated Aadhar letter is already dispatched by UIDAI, the message will appear accordingly. Call on 1800 300 1947 in case of any query for your Aadhar update status. Chhindwara, Madhya Pradesh – 480001. If you have just applied for your Aadhar Card or planning to apply, check out the related posts at our blog. You can check the status of the newly applied Aadhar Card. Aadhar Card update status is a very useful facility by the UIDAI’s self-service portal. This post will help users to get familiar with this online facility. ipancardstatus.co.in brings all the information you need to know about your passport, PAN Card and Aadhar Card. Know how to check PAN Card status at UTI and NSDL portals. If you are an applicant or want to apply for these essential documents, our blog is the best guide for you. If you are still confused about tracking Aadhar Card update status, leave your comments. Keep visiting us for any information on PAN Card and Aadhar Card. You can easily check Passport status online or offline. Passport is now a very important identity document for the citizens of India. It is also called a gateway to abroad. It is the only document accepted by every country officials. This post will direct you to the appropriate online place to check your application status. Passport application status can be checked at the official portal as well as the Passport Seva Kendra nearby your region. Follow the link given in this post and enter your file number and date of birth. We have also shared process of tracking through SMS, by phone call and with the Mobile Passport Seva App. All the procedures are well elaborated for your best convenience. Applicants can start tracking once they visit PSK and fulfill all requirements. We recommend you to start checking within few days from the submission. It will take at least 5 working days to show your application status after you submit it. Messages will clearly indicate how far it has been processed. You can download m-Passport Seva Mobile app for free on your smart phones. Click here to reach the official website or you can also try ipassport status website for the same purpose. Select the option of Passport at Select Application Type. Fill your file number and date of birth in the relevant fields. Give a click on Track Status to view status. Be sure to start tracking only after 5-6 days from the date of submission. Be careful to go through the status messages if it shows any reason for delay. Any additional requirements for processing your application will also be displayed. Follow the message and take action accordingly if required. You may submit any additional documents to the passport office. No matter, if it is not convenient to check online. Use this method of mobile SMS. Send the application file number to the given number. Make sure that you send SMS exactly in the format prescribed below. Status of your online Passport application will be sent on your mobile through SMS. You can avail facility of chargeable Premium SMS services. Select SMS Services in your form before submitting it. Additional charges of Rs. 40 are charged for this. This allows you to receive all details of your application and dispatch of your document through mobile SMS. Call on national call center on below mentioned toll free number. Inform your file number to the call center executive. You will get the current status of your application. Customer support executive will be responding at the above toll free number from 8 AM to 10 PM on all government working days. Government has also introduced Passport Seva Mobile app. It is available on Android, iOS, Windows and Blackberry mobile platforms. See the following steps to know that how you can check your Passport application status with this app. Click here to download m-Passport Seva app on your Android phones from Google Playstore. Install it for iOS from app store. Download this app for your Windows phone. Users of this app can track their applications. Locate PSKs and calculate fee for Passport applications too. App also provides information on where to call or contact for any query. All measures are taken by the Ministry of External Affairs to keep the facilities of Passport Seva up to the mark with the changing times. We have uploaded all ways to check Passport status. Share with us if our post has helped you to track the status of your Passport application. Our site also updates on complete online application for this document. Passport is a basic travel document and a proof of citizenship. You can browse our site for information related to Passport. Information on PAN Card tracking status and Aadhar Card status by name and many others are also available at our portal. Additionally, you can check istatus.co.in portal for all sorts of government related documents’ status. By now, we are well aware how significant the Aadhar Card is. Linking EPF with the Aadhar Card is an initiative by the government of India to give a further boost to the UID enrollment. UIDAI camps and centers are established near industries to attract more and more employees to enroll for the Aadhar. If you want to link your Aadhar Card with EPFO account or UAN, go through the post thoroughly. Employees Provident Fund Organization (EPF) provides Life Insurance, Employees Provident Fund, and Monthly Pension services. The Government has mandated to use UID platform for all these three services. Those who do not have their Aadhar Cards will get an Enrollment ID which can be later transformed into their Aadhar numbers. In case, if you are yet to get your Aadhar Card, you can learn a method to get Aadhar Card online. To avoid any hassle in EPF services, link your Aadhar with your EPF account and UAN account. Simultaneously, beneficiaries will have to link their Aadhaar numbers with their bank accounts. The present scenario demands beneficiaries to immediately integrate their UID with their EPF accounts. EPFO officials are providing benefits directly to the bank accounts of the beneficiaries. 85% of the receivers are getting EPF payment by NEFT facility. Hence, we have shared the procedure with step wise guidelines. The process of linking is to be carried out online at www.epfindia.com. See the options under “Our Services”. Click the option of “For Employees”. At the bottom, you will find the option of “UAN Member e-Sewa” under “Services”. Login using your UAN number and the password. (If you have not activated your UAN, refer to our post UAN Status. After successful login, go to “Profiles” drop down menu. Click on “Update KYC Information”. Enter all the KYC Information on the page i.e. you will be entering your PF account number in the current member ID field. Select the KYC as Aadhaar. A copy of the cancelled Cheque for your Bank Account Number. This is to verify your bank a/c. no., IFSC code of bank and beneficiary name. Once you upload the documents, your details will be in Q waiting for approval. You can start checking the status after 15 days. The status will be viewed under uploaded Approved/Rejected KYC Information at this page. We once again reiterate that your UAN (Universal Account Number) should be activated at the EPFO portal. After that, you can link your Aadhar number with your EPF account and UAN from anywhere. When you choose KYC from the drop down menu, you will find an option for many other documents besides Aadhaar. The most significant ones are PAN, Aadhaar and Bank Details. Normally Bank details are to submit PF corpus into account. PAN and UID are to verify your identity. Aadhaar number provides most secured KYC information. With linking of EPF/UAN with your UID, EPFO can access all your personal details. This indeed simplifies the process of your PF claims, transfers, and withdrawals. Now and in future, EPF withdrawal is definitely going to be a speedy procedure due to its integration with Aadhar number. If you have any issue with linking your Aadhar Card with your EPF/UAN, leave your queries here. We will try to resolve them at the earliest. If you are an EPFO member, do link your Aadhar with your EPF account. You can refer to our other posts on UAN activation and PF balance status to get familiar with EPF portal. Our portal is dedicated to provide everything you need to know about the Provident Fund. Lakhs of employees are members of EPF and waiting for their PF withdrawals. Our aim is to help them through our information and by simplifying the PF procedures. Stay with us for the latest updates on EPF. Aadhar Card is a 12 digit unique identification number issued by UIDAI (Unique Identification Authority of India) on behalf of the government of India. Aadhar number serves as Proof of Identity (POI) and Proof of Address (POA) anywhere in India. It is necessary to have Aadhar Card if you want to be a part of the Digital India. Learn how to get Aadhar Card in India easily. Unlike other government documents which involve lengthy processes to get them, this is much simpler and pain free. Aadhar is unique and important and it is issued only once in a lifetime to the citizens of India. It doesn’t act as proof of citizenship but is valid as POA and POI to avail various government services and schemes like LPG, Passport applications in 10 days, instant new bank accounts or other daily needs anywhere in India. Aadhar number received through post by UIDAI and the electronic version of Aadhar Card downloaded online through the official portal of UIDAI is equally valid. It is very easy to enroll or get Aadhar Card as compared to other identity cards issued by the government of India. Even if you have misplaced or forgot your Aadhar Card details you can get the duplicate Aadhar Card at the official portal of UIDAI online. Collect Documents: UIDAI accepts a number of documents as POI (proof of identity) and POA (proof of Address) while applying for the Aadhar Card. Children (below 5 years) can be enrolled on their parents’ documents and they have to submit a POR (proof of relation) with them. All the documents should be self-attested. Minors’ documents should be attested by their parent or guardian. Check here complete list of documents required to apply for Aadhar Card. Book online Appointment: Some people hesitate to apply for Aadhar Card fearing that it would take too much time to process and apply. But to Apply Aadhar Card, UIDAI has given a facility to book appointment online at official portal of UIDAI. But the entire process to get Aadhar Card is not available online. After booking online appointment, you have to be physically present at the Aadhar Enrollment Center for your bio-metric scans like photograph, fingerprint and iris scans. Click here to book online appointment. You can also cancel and reschedule booked online appointment. Click here to cancel and reschedule online appointment. Fill and Submit Application Form at Aadhar Enrollment Center: Aadhar Enrollment Form is totally free of cost at Aadhar Enrollment Kendra. You can also download application form online from the UIDAI portal and take the print out of this form which is equally valid at all the centers of India. The form for Enrollment/Correction in Aadhar Card is unique throughout India and same form is used in all the Indian States. It is mandatory to fill the application form in CAPITAL LETTERS only. After filling up the form, visit the enrollment center and submit it there. Then hand over all the self attested documents to officials present at the center. They will verify your documents and take your iris, fingerprints and face scans. After submitting the form they will give you an acknowledgment slip. This acknowledgment slip has your enrollment ID (EID) which helps to check your Aadhar enrollment status. Click here to download Aadhar Card form. Check enrollment status: There are different methods to check Aadhar application status: Online Method, By SMS and Calling Help-desk Number. In online method, you need to have the acknowledgment slip with you. Fill your enrollment number and date mentioned in the acknowledgment slip with you. You need to go to the UIDAI resident website to check your Aadhar Card status online. You can send SMS to check your Aadhar application status. Send this message UID STATUS<space><14 DIGIT ENROLLMENT NUMBER> to 51969. Once you will send the message, after some time you will get the SMS notification that whether your card has been dispatched or not. You can also Dial Toll-Free Helpline: 1800-300-1947. The representatives will tell your application status on call. We recommend you to also ask your tracking number of courier from them. Download e-Aadhar Card online: Finally, if you haven’t received the hard copy of your Aadhar Card at your doorstep or have been lost or misplaced then you can download the electronic version of Aadhar Card from the UIDAI official portal. Fill your Enrollment ID and registered mobile number to get your Aadhar Card online. You can always track your Aadhar Card status using name and number. If you are having any trouble in getting your Aadhar Card then do let us know. Our team will try to help you out to resolve the issue as quickly as possible. Aadhar card is an essential document for most of the government led projects. Although, it is not compulsory to have an Aadhar Card (unlike PAN Card), it has become one of the authentic government approved ID proofs. If you are looking for how to apply for Aadhar Card online, then you have come to the right place. It is a topic which has been discussed earlier a lot many times. One can easily download Aadhar Card Application Form online and book an appointment. Please note that you can obtain forms and schedule appointment online. Submissions of application form are to be done manually at the enrollment centers. Government has also started facility of scheduling appointments at the selected centers. This post will guide you to online procedures related to application for UID number online. Downloading application forms, getting appointment, downloading e-Aadhar Card are some of them. If you are waiting for your Unique Identification number, check your application status online. Aadhar Cards are issued through a very large network of enrollment centers. During last year, Government has facilitated linking of UID to various other schemes. Some of them are PMJDY, Passports, Scholarships, Pensions, LPG Connections and bank accounts. Applying for Aadhar Card has become significant for citizens due to surplus benefits it offers. Before you learn how to apply Aadhar Card online, you should know where to get its application form and how to fill it up. Follow the below link for the official site of UID to get all the necessary information. Select the language from the drop down menu at the top bar. Click the Downloads option below and download the form. Fill up the form by following the instructions given at the second page of the form. You can visit your nearest enrollment center with a proof of identity and a proof of residence. You can also apply for any correction in your existing card using the form available online. Selected enrollment centers are now covered under the online appointment scheduling. Click on the below shared link of the UIDAI site to schedule your appointment with the UID enrollment center. This procedure related to how to apply for Aadhar Card online has been introduced on the trial basis in some cities. Enter necessary details and select the date and time of appointment. It might happen that your region is not listed in the enrollment center drop-down list. In that case, you can just walk-in to your nearest enrollment center to submit your form and fulfill the formalities. The facility is introduced at many cities in major States like Maharashtra, Gujarat, Delhi, Andhra Pradesh, Punjab, Haryana, Telangana, Chandigarh and Bihar. Once your application for Unique Identification number is complete, you can track the status of your application online. If your Aadhar Card is ready but has not been sent, you can get it online. E-Aadhar Card is valid at all places just like the original one. Enter your enrollment number in the box. Or enter your existing no. to download corrected one. Get the One Time Password on your mobile through SMS and enter it in the box for OTP. Lastly, click on Validate and Download. Aadhar Card has gained vast acceptability and registrations in a very short period. You can get UIDAI status after the successful submission of the form. It has become a powerful proof of identity with the life time validity. Its significance is further growing as it is being linked with other useful accounts like- bank account, LPG connection, etc. Application of unique identification number is very slow in NPR States as compared to other UIDAI States. Newly introduced online appointment booking for UID will save your time over Aadhar Card application. After carefully following above steps, it is a time for checking your Aadhar Card status online using your name, number and other details. Similar posts for Passport and PAN Card are here. Use the search option and explore huge compilation of useful information as per your need. We are sure our post on How to Apply for Aadhar Card Online will help you avail facilities at uidai.gov.in. Track status of other significant documents including PAN Card and Passport too at our site. iPANCardstatus.co.in offers latest information to help Indian citizens on various government procedures. Guide to online PAN Card verification by Name and Date of Birth! Verify any one’s personal details by PAN number. Or verify PAN number just by entering personal details like name and location. PAN Card verification facility can be used by any individual or entity. You can cross check the personal details of persons or firms by entering their PAN number at the official portal of income tax department. PAN Card is a powerful tool for Income Tax to track all the financial transactions and avoid duplication. This post brings you online methods of verifying PAN number and personal details using PAN number and name. PAN Verification is sometimes needed to check genuineness of the PAN Card holder. This document connects income tax department with all the financial transactions made by a person or firm. Such transactions cover payments of taxes, wealth, FBT returns, TDS returns and credits. UTI also offers PAN Bulk Verification. A layman’s guide to apply for PAN Card was already given in case if you are looking to apply for a fresh PAN Card. Educational Institutes and commercial institutes like banks, mutual fund, insurances companies can apply for PAN Bulk Verification facilities. Verify details by entering PAN number of any third party. You can carry out online PAN Card verification at portals of income tax e-filling, NSDL and UTI. See below how you can check personal details like name, address and domiciles using PAN number at income tax e-filling. Visit income tax e-filling site’s Know Your Jurisdictional Assessing Officer. Enter the complete PAN number you want to verify. Enter the captcha code in the next field. Give a click on submit button to proceed. You can view the complete name of the person or firm and his jurisdiction. PAN Card details viewed on the screen will give you the details like- name, surname and domicile of the PAN Card holder. This online facility helps numerous financial and other firms to cross verify details of people hiring their services. Know your PAN is a free online PAN Card verification offered at e-filling website. You can obtain PAN number by entering personal details like date of birth and surname. Give a click here to reach Know your PAN page at income tax e-filling site. Surname and Birth date are mandatory fields. Enter surname. See that you do not misspell any details. Enter middle name and first name in the next text boxes. Enter captcha code as shown in image in the last box. Click the submit button to view the PAN number. Most of the Chartered Accountants (CAs) use the same portal to cross-check your details. It is highly recommended that you use the same. In most of the cases, your card will be registered with an email address. In many cases, CA uses their own email. We highly recommend you to register your own email instead of CA’s. Additionally, you can also go through NSDL and UTI portals to get your PAN Card and all the transaction details. A guide to check NSDL PAN status and UTI PAN status has already been shared by us. Why PAN Verification is Needed? PAN verification facility comes useful as it might happen sometimes that the information on the PAN Card differ from the one saved in ITD data. You can know your Permanent Account Number just by entering your name and Birth Date. The Bulk PAN Verification facilities are also available for agents, banks and financial service providers. In case, you see some errors in your PAN Card details, then it is a wise idea to get it corrected. Go through PAN Card Correction Form and submit it to the NSDL/UTI portal to get it corrected. Besides using this facility for yourself, you can use it to confirm legal identity of third parties. Thus, you can be sure of your safety before entering into any kind of transaction with them. PAN Card is basically a powerful weapon for the Income Tax Department and also for other institutions and individuals. Procedures like income tax payments, IT e-filling and PAN Card applications have turned digital. Hence Government offers many additional online services to help users. You can also track status of your PAN Card application. Hope this post helps you in retrieving your PAN number on the basis of your details. Quick online PAN Card verification helps lakhs of commercial units and individuals to verify personal details of unknown parties. Hence online platform allows you to access your PAN number in case you need it anywhere urgently. You can also verify your personal details that are available at ITD database. Know how to apply for PAN Card at the UTI and NSDL portals. This article contains procedure for the application of Permanent Account Number online. Applicants can apply through the UTI or NSDL portals and send the necessary papers to the respective offices. We suggest applicants to go through our guidelines before applying. Complete acquaintance with the online procedure will simplify the procedure for you. Moreover, you will also know the documents which you should keep ready for the PAN Card Application. Access the official portals from here and start your online application for a fresh Permanent Account Number. Permanent Account Number is a unique alpha-numeric code issued to individuals or commercial units. Due to its significance, more and more people are obtaining PAN Card. PAN Card is mandatory for tax payers and to get income tax returns. The alpha numeric code is issued in the form of a laminated plastic card. It is valid for the lifetime and can be issued only once. In case of lost and damage, duplicate PAN Card can be obtained with the same number. A guide on how to apply for Passport has already been shared. How to Apply for PAN Card at UTI? Click here to reach the UTI portal. You will reach the page where Form 49 A is displayed. Select appropriate option from the drop down menu. If you want to apply as an individual, select individual. Start filling up the form and click on ‘Submit’ button at the end of the form. Click on ‘Validation’ to check your form. If it is correct and complete, click on ‘Make Payment’. Once you get ‘Success’ message after making payment, get the print out of the form. Affix your two photographs on the printed filled-up form with 3.5 x 2.5 cm size. Your photographs should be signed across. Also sign at the allotted spaces on both the pages of the form. Send proof of identity and proof of residence along with your form to the nearest UTI office. UTI Infrastructure Technology & Services Ltd.
Once you are done with the above process, you can track UTI PAN Card status online from their portal. Your PAN Card Application should reach NSDL office within 15 days from the date of online submission. You will receive PAN Card by registered post or courier to your address provided in the form. Follow the complete procedure to know how to apply for PAN Card at the NSDL portal. Click here to reach the NSDL portal to get– Form 49 A page. Go through the instructions given to fill the form. At the bottom of the page, select the category of Applicant. Give a click on Select button. Now you can fill up your form and submit it by clicking on the submit button. Check the form before clicking on ‘confirm’. You will get page with payment terms and conditions. Click ‘Agree’ and proceed with the payment. After payment is done successfully, you will get acknowledgement form with 15- digit number. Take a print out of this page and sign it. You can also pay by sending DD or Cheque with this form. Send this form with photographs and the copies of necessary documents. Mention ‘APPLICATION FOR PAN – ______________’ over the envelope. Fill in your 15 digit acknowledgement number in the blank space given above. Send it to the Income Tax PAN Services Unit, NSDL e-Governance Infrastructure Ltd., 5th Floor, Mantri Sterling, Plot no. 341, Survey no. is 997/8, Model Colony, Near Deep Bangalow Chowk, Pune – 411016. Like UTI, you can track NSDL PAN Card online from its official portal. In case, if you have lost your PAN Card, you can apply for a duplicate card as well. A detailed guide on how to apply for duplicate PAN Card has already been shared. If you don’t receive your PAN Card within 3-4 weeks, check your PAN Card status online. Refer to our post on PAN Card status to track application status. ipancardstatus.co.in provides all guidance and information that you will need for PAN Card. There is also a PAN Card Correction Form available in case if you entered the wrong data. It covers all information including application, tracking, duplicate PAN Card and correction in data. We are sure that applicants can easily apply after going through our post on how to apply for PAN Card. Keep visiting our site for information on Passport application and Aadhar Card too.